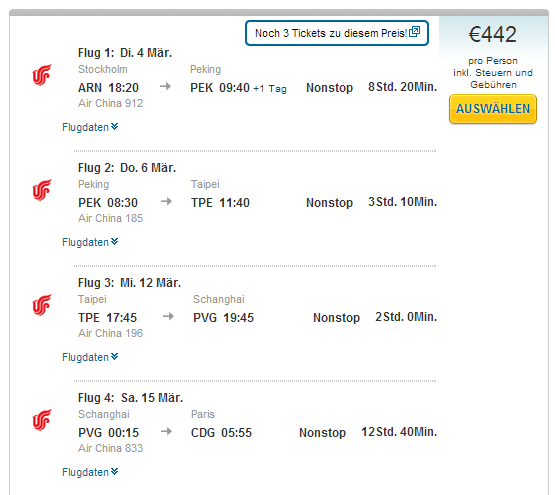 3 in 1: Peking, Taiwan and Shanghai for only €442! Air China now offers amazing prices for anyone who wants to combine three cities in one trip and experience China and Taiwan in one! Multicity flights Stockholm – Peking – Taipei – Shanghai – Paris are available for only €442! If you prefer another departure place, you can fly also from Dusseldorf for only €499. 24.3., 28.3., 7.4., 9.4., 11.4. Check if you need visa before traveling. Most countries allow free stay up to 72 hours without visa. Book in German on Expedia for the best price. « Super cheap return flights Warsaw-Stockholm for only €13!